The Greater big-footed mouse is another species only found on the island of Madagascar that is coming under great threat. With the combination of fire during the dry season, cattle being pushed into its habitat and habitat loss mostly due to the human expansion the population of Greater big-footed mouse is declining. Currently classed as critically endangered the Greater big-footed mouse population is under strain and there are currently no estimate to how strong the population may be. Being a medium sized mouse the Greater big-footed mouse can be hard to spot at times but is instantly recognizable by its feet after which its named. The feet of the Greater big-footed mouse are long and thin with a total of five digits of which the middle three are significantly longer. The Greater big-footed mouse has large ears and a very long, stiff tail with a tuft of fur at the tip. 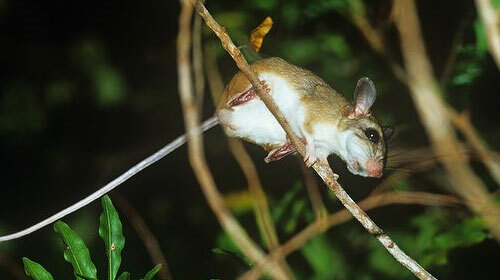 Although predominantly brown in color the underside of the Greater big-footed mouse is a great deal paler. Not a great deal is known about the elusive Greater big-footed mouse as they tend to keep to themselves and are difficult to spot. It is believed that the Greater big-footed mouse are nocturnal and spend their days sleeping in their underground burrows. When out looking for food at night the Greater big-footed mouse can almost always be found up in the trees rather than on the forest floor. this mouse is absolutley beautiful and i wish my brother was a mouse this cute because mice are cute and guesswhat i dont have a mouse blah blah blah and guess what else i still wish that my brother waws a funny duck because i like ducks and im in the 12th grade and i think that ducks should be on the flag for the USA becuase ducks and mice ROCK MY SOCKS!!!!!! !